I don’t know if it’s because I grew up in the UK where it’s rarely sunny, but as soon as the sun comes out here in Rome I can’t wait to get out in it – and I’m always on the lookout for great places to sit outside and soak up the rays over coffee or lunch. My new favourite place to do this is the Circo Massimo Farmers Market, held on Saturdays and Sundays. I love going to the market anyway in Rome to stock up on seasonal veggies and good quality meat for the weekend, and Circo Massimo is a great one – all the stalls come from the area around Rome, and there’s everything from fish and meat to olive oil and wine. The best thing for me though, being an avid food lover, is the street food market in the courtyard at the back. 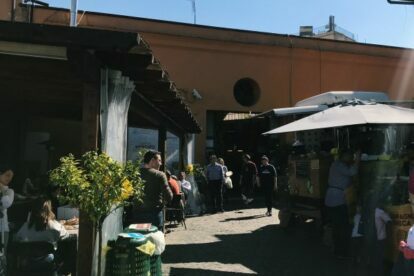 There are tons of adhoc tables, where you can pull up a seat alongside all the other locals out for a drink, snack or lunch – then go to any of the stalls around, who serve everything from fried fish, pasta dishes and meatballs to vegan soups and smoothies. Of course, there’s also wine and beer – it’s all freshly made, and at really reasonable prices. Eating and drinking local food and wine out in the sun in the middle of Rome is the perfect weekend activity!